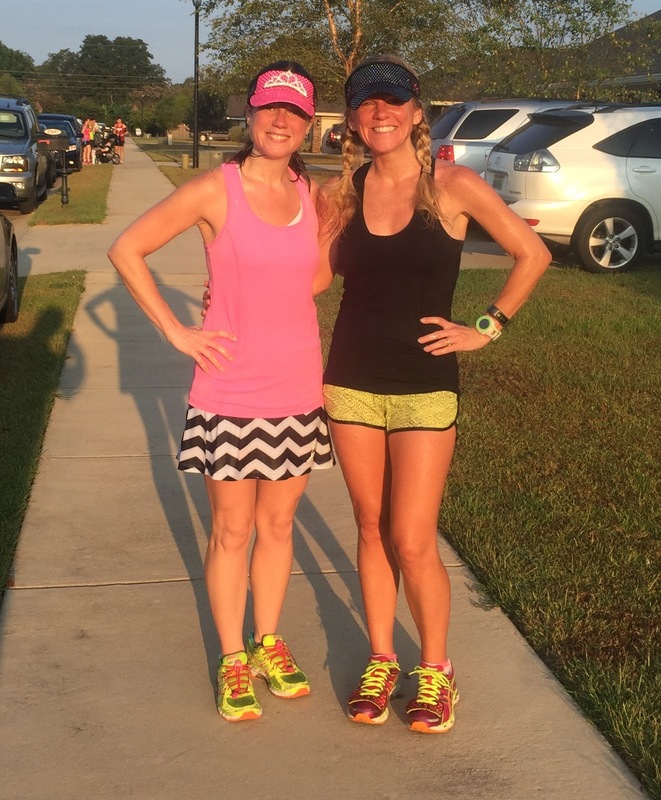 Road Runner Girl: Gulf Coast Half Marathon Training...Week 8! This week 10 miles was on the schedule! This would be my first two digit run since April! I was looking forward to it! 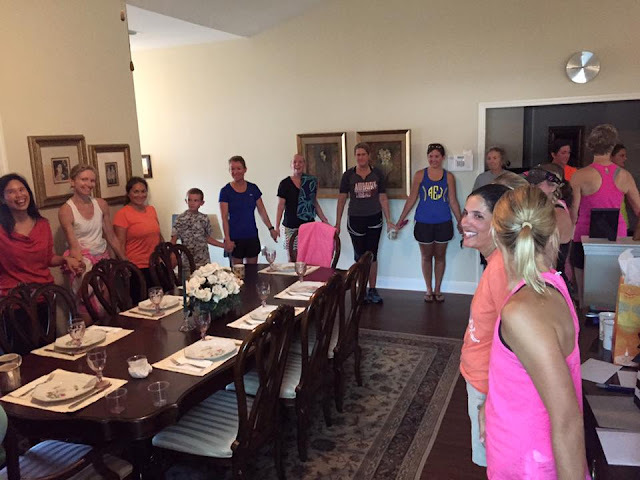 And after the run all my Sole2Soul Sisters were meeting at Donna's house for breakfast and a wedding gift card shower for my friend Paige who is getting married this weekend! Some of the Sole2Soul Sisters met at different times to run. Jenny and I decided to run a little later but still make it to breakfast. We parked at Donna's house since that's where we would need to end up at the end of the run. The temperature was in the mid 70's when we got started running. But the humidity was around 94% so that made it seem hotter. When we started it was also pitch black dark outside. Jenny and I both said we don't like running in the dark but it's necessary when we are training. And now that the days are starting to get shorter it's hard to avoid the dark. Thankfully the sun started rising around mile 2. It was so pretty seeing the sunrise across the field! Around mile 3 we saw a dead raccoon on the road. 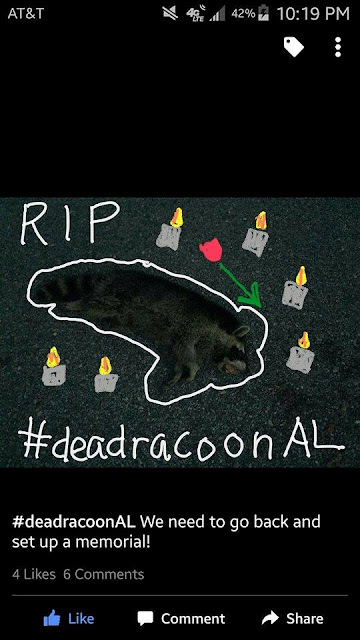 It made us laugh because our friend Leigh had just sent us a story about a dead raccoon in Toronto that lead to a memorial and hashtag (#DeadRaccoonTO) in honor of the dead raccoon! It's hilarious! Check out the story HERE! So of course we had to send a picture of the dead raccoon to Leigh with our hashtag #DeadRaccoonAL!!!! And being the awesome friend that she is...Leigh sent us this picture the next morning! Lol!!!! We continued our run laughing about the raccoon! We got to mile 5 and all of a sudden we saw a black lab come running towards us! Jenny assured me that this dog was sweet and ran with her all the time. He was super sweet! And so happy! He ran with us and stopped at almost every tree to pee lol! He was just so happy running along with us! He ran the next 1.5 miles with us until his owner came looking for him. By this time we were headed back. I thought I would be thinking about breakfast the entire run but surprisingly I did not. And we didn't even talk about food which is so unlike me and Jenny on a run! We usually talk about food and how hungry we are lol! The sunrise was super pretty when we passed by the field again! Before we knew it we had made it back to Donna's neighborhood! We had to conquer a hill before we were finished though. We did it and finished strong!!! Jenny and I talked about slowing down for this double digit run. We said running in the 9's would be our goal. But apparently we can't slow down! Our average pace for 10 miles was 8:53!!! We were soooo hot and sweaty after the run!!!! We stretched and tried to dry a little before heading inside Donna's house for breakfast. It was so awesome having so many Sole2Soul Sisters together to eat and celebrate Paige and her upcoming wedding!!! And breakfast was so yummy! I was hungry after those 10 miles!!! Paige, me, Donna, and Jenny! I really enjoyed talking to these ladies long after everyone else had left! It was a super fun morning of running, eating, and fellowshipping! And Donna had tons left over so she sent me home with a gallon of low fat chocolate milk! Yum!!! And of course I drank some after my run for recovery! It's my favorite way to recover! QOTD: What is your favorite food after a long run?